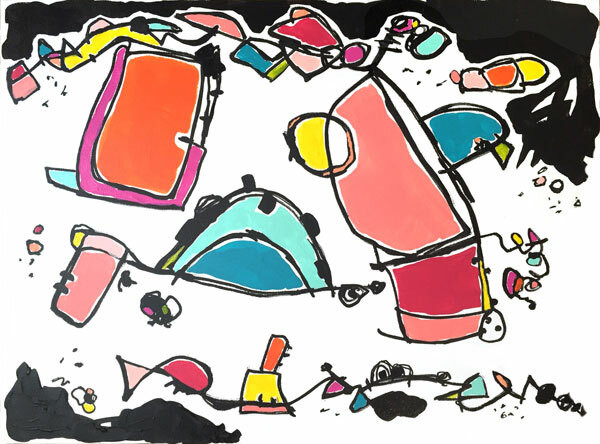 One of my newest bodies of art work combines both a playful look with bright colors, black and white. These are Intuitive Abstract paintings done on canvas and some created on heavy bristol board, a type of archival artist’s paper. I refer to this type of work as intuitive because I start each painting without any pre-conceived idea of what I will paint. It is actually fun to watch a painting unfold before you … much to my surprise. Obviously, decisions to have to be made once you start, deciding what color to put where and what spaces to leave white, etc. I start by drawing random lines and shapes until I am happy with the overall composition. Sometimes, I will add extra elements as I go along. Some of these pieces can be seen and purchased through Saatchi.